Today Inventables launched X-Carve, our next generation 3D Carving machine. It’s the start of a new chapter for us and we’re very excited. Our mission at Inventables is to bring out the maker in all of us. We envision a world where the the digital fabrication revolution empowers a new generation of makers to be able to dream, design, and fabricate their ideas into products. We believe low cost digital manufacturing tools are making it easier for people to prototype and do short production runs. We believe by focusing on making the experience easier, we’re helping to ignite this change in not only what products can be made but, more importantly, who can make them. In 2012, we collaborated with inventor Bart Dring to commercialize the MakerSlide railing system. Later that year, with MakerSlide as the foundation, we started selling a fully open source (open hardware) 3-axis 3D carving machine kit that anyone could build. The kit cost about $300 for the mechanicals and $600 for the fully functioning machine. Most people that bought the machine were hobbyists and enthusiasts. The response was tremendous. Over the last few years, as the technology improved, we’ve started to observe a transition by our customers. What was once predominantly a group of hobbyists building a machine for the love of the game has transitioned to a group that also includes folks making and selling products for fun and profit. We are inspired by the amazing ways customers have brought ideas out of their heads and into the world. They make everything from circuit boards to skateboards. In March of 2014, we launched Easel. It was a step towards taking complexity out of the process. We wanted to simplify the software tool chain so you can “just click carve”. It was part of a realization that the world needed more than a new machine- it needed an incredibly easy system (software, hardware, and materials). We needed a brand to represent our vision and serve the trajectory our customers were on. We needed a brand to go beyond servicing a hobby and one that could deliver on production work in the shop. Enter X-Carve. The letter X in the name is intended as a variable that is defined by the customer. We hear from customers that their needs are unique and they don’t want extra parts lying around. We hear from customers that they want an upgrade path. We hear from customers they want a machine that can grow with their needs. X-Carve is capable of creating precision parts and models from plastic, wood and metal. The machine is the latest addition to Inventables’ 3D Carving ecosystem, which also includes our Easel design and machine control software, a project-sharing website, a selection of hundreds of carvable materials, and Carvey, an enclosed machine suitable for an office or home setting. X-Carve was created for a workshop setting. It has about half the parts of other kits on the market, and is both customizable and expandable. It is also fully compatible with the previous 3D Carving kit offered by Inventables, the Shapeoko 2. We’re also selling an upgrade kit because we don’t want to leave anyone behind. We put together an introductory video walking through all the details. The Inventables website guides users through customizing the exact machine they want. Parts will also be available a la carte. We heard over and over again that people want to build machines in different sizes, with different electronics, and motors to fit their specific needs. In response, we built a tool that will allow them to customize a machine to do exactly what they want without having to buy unnecessary parts. Please join us in this next chapter at Inventables by making your mark on the world. Great stuff. I'm looking forward to getting one of the Shapeoko2 Upgrade kits. I've got some questions though. Looks like there is no provision/holes for limit switches for hard limits? I see that there are 3 sets of holes drilled and possibly tapped (Z) for homing. Can't quite tell though. Will the Shapeoko 2 upgrade kits come with pulleys and belt for the Z? What is the new Z clearance with the new extrusion and gantry end plates? From the images, we lose some Z clearance with the new beefy extrusion, but gain some with the end plates? There are provisions for limits on X-Min, X-Max, Y-Min, Y-Max and Z-Max. Our limit switch kits provided all switches, wiring and hardware for one switch per axis. We like to home to X-Min, Y-Min and Z-Max. The upgrade kit includes the (3) pulleys (5mm, 1/4" and 8mm bore) and the belt. This covers the possibility you have a NEMA 17 or 23 for your Z. You know, you're making it really hard to hang onto my money. Many thanks for the answers Bart, and great job on the design and upgrade path for us Shapeoko 2 fans! This looks really good. 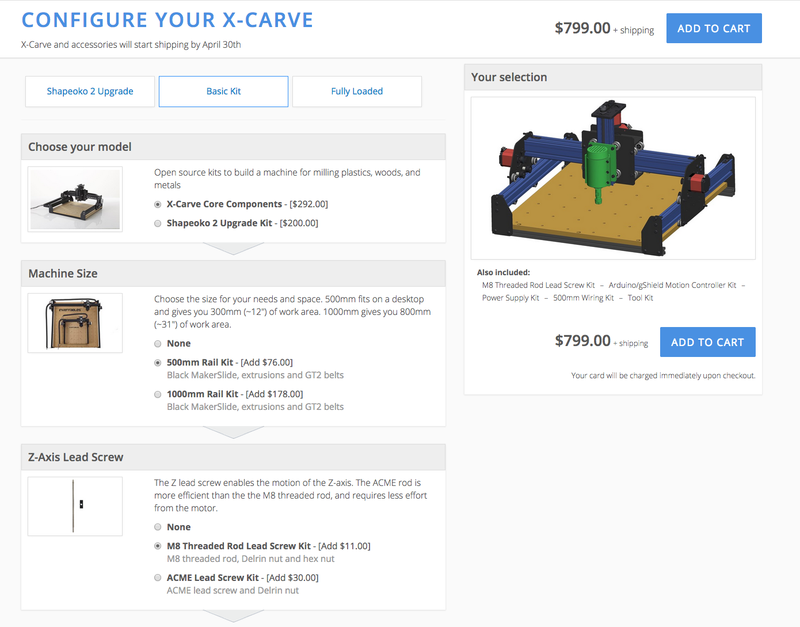 I was about to order a Shapeoko 2 but now I have no choice, I will get an X-Xarve. I have a few questions. I was going to make a 1500mm x 1000mm shapeoko. Will you be offering the 1800mm Makerslide in black anodized so I can match it to the rest of the machine? Is the Colt mount compatible with the Dewalt 611 as was the previous one? I have already bought a couple upgrade (ACME screw) from shapeoko.com, is the Z axis still the same length? What parts are included in the ShapeOko2 upgrade for $200.00. I looked around but did not find a list.